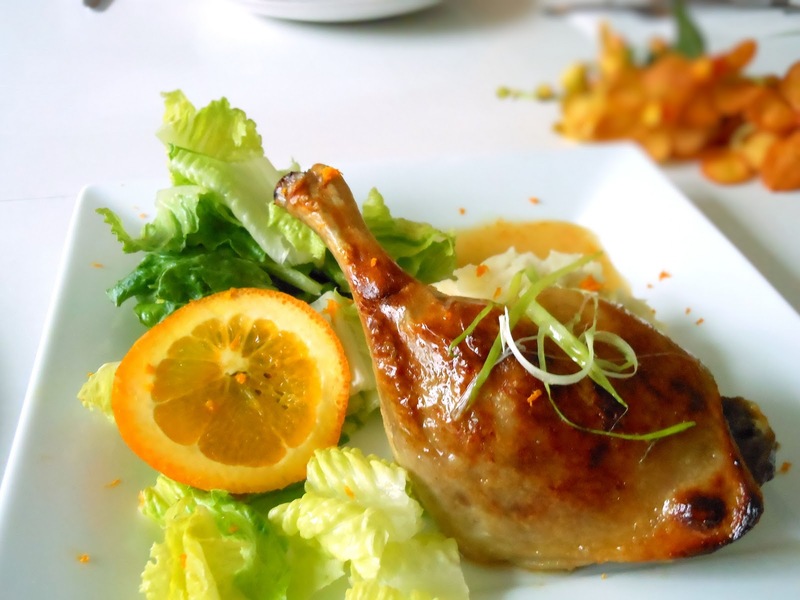 Duck legs are on sale at one of our local supermarkets this week. That sounded good to have for dinner, and something that I didn't normally cook for the family. So I bought a few while I was doing my grocery shopping. Since they were frozen, I couldn't use them the same day I bought. I kept them in the freezer and took them out yesterday morning. After the duck legs had thawed completely, I started cooking them in the afternoon. I had looked up some recipes of the 'Duck Leg Confit,' but I didn't like the whole long process. So I decided to cook the duck legs my way. One of the ingredients I used was lemongrass. 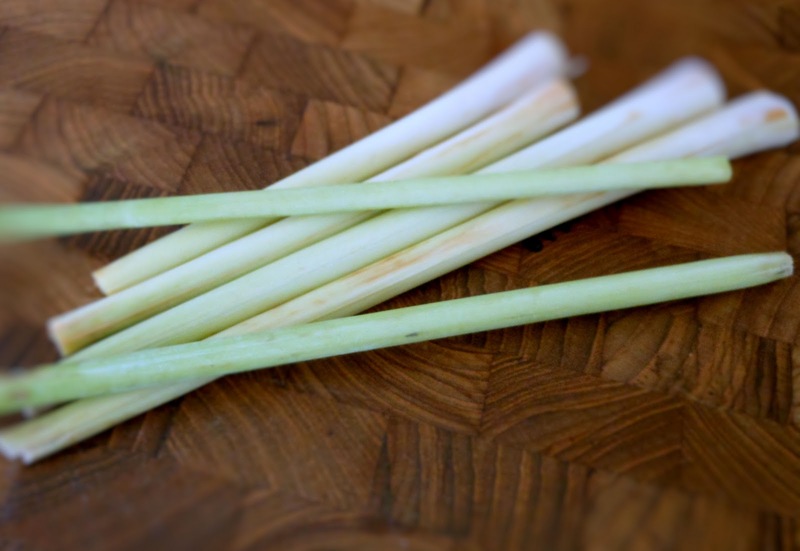 Lemongrass has a zesty flavor, and the aroma is incredible. It always goes well with any kinds of poultry. You can probably find it at your local Asian markets. It is usually sold in a bundle of lemongrass stalks. Yesterday, the duck legs tasted perfect with the mashed potatoes on the bottom, and the orange honey gravy on the side. I didn't pour the gravy over the duck legs as I wanted to maintain the crispiness of the skin. Pour 12 cups of water into a pot and boil over high heat. Add lemongrass, rosemary, basil, sugar, and salt and bring to a boil. Put the duck legs in the pot. Cook uncovered with the ingredients over high heat for one minute. Then turn down the temperature to low heat. Continue to cook uncovered for 50 minutes to one hour with the ingredients. Remove from heat. Place the duck legs on a rack inside a pan. Let dry for one to two hours. Place the pan in the oven and bake the duck legs for 15 minutes. 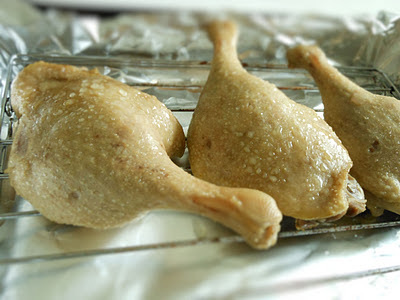 Turn the oven to broil/grill on high and grill the duck legs for 4 minutes so that the skin becomes crispy. Remove from the oven. Serve with mashed potatoes, salad greens, and the orange honey gravy immediately. Whisk all the ingredients except butter together. In a small saucepan, heat butter over medium heat. Add the flour mixture slowly to the butter and continue to whisk until thickened. Serve on the side of the duck legs.